Have you seen Meet Joe Black? It's that film starring Brad Pitt, Claire Forlani, and Anthony Hopkins about a lad who comes to earth in the form of a human but he's really Death. While there, he learns all about love, heartache, and what it means to be a person who is alive, rather than what he is, which is Death. It's a weird movie but it's got decent reviews so watch it if you haven't seen it and like young Brad Pitt, we guess? 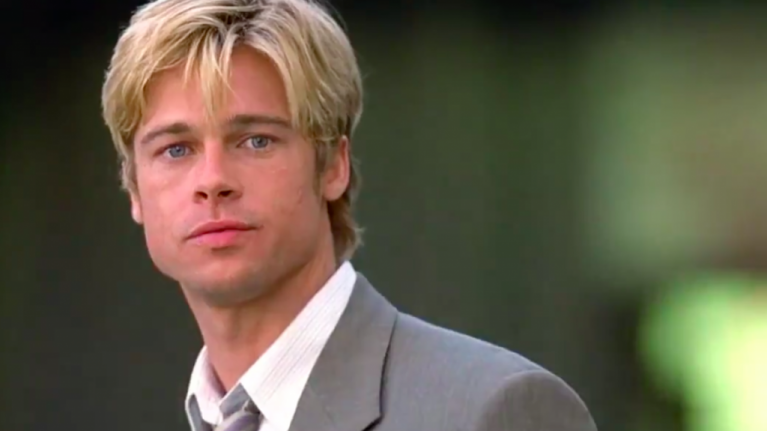 Meet Joe Black had a bit of a resurgence on Twitter last night, but not because a load of people had recently discovered it and thought it was great - but because of the below scene. It's one minute and 19 seconds long and you need to watch every single frame of it. If you can't be bothered watching the clip, or simply prefer to read descriptions of events, here's what happens. Brad and Claire meet at a coffee shop and eventually part ways despite not wanting to because they're into each other or whatever. What follows is a ridiculous and obscenely long scene where the pair both stop and look over their shoulders a record 80 times to see that the other person is walking away, seemingly not interested. It's the end of the scene though that people are particularly n'able for - when Brad gets knocked by not one, but two, cars. Literally straight up plowed into by them, because he won't stop looking over his shoulder. Naturally, everybody on Twitter thought so too and they took it upon themselves to absolutely rip into the 1.19s scene. I am so glad people are rediscovering this scene.